Marvin was really surprised this week when he was reading his book about animals because he discovered that butterflies and moths are not the same animal. He thought that butterflies were just more beautiful than moths but the truth is that they are a different species of animals. For example, if you look closely, moth’s antennae are usually wide and feathery but a butterfly’s antennae are thin with little knobs at the top. The moth also has a body that is quite fat and furry but a butterfly has a skinny body. The main difference though is that moths fly about at night, whilst most butterflies fly during the day. 1. Why did the boy wear a life jacket to bed? 2. Why did the girl go to school at night? 3. How do ducks play tennis? 4. Where do tadpoles change into frogs? 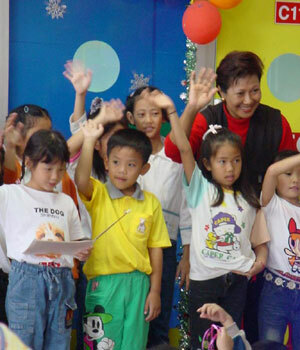 CEC Language-Computer School Kiatpattana threw a fun-filled Christmas Party for their students this year. 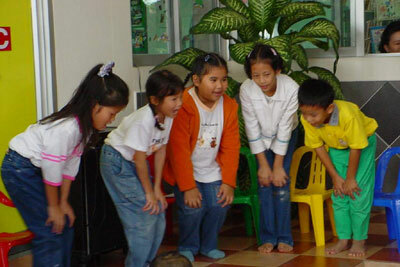 All the children had fun in English skills activities and pretty performances for the teachers and their friends. Chiang Mai Zoo officially launched many activities, with the director, Tanong Nateepithak, inviting animal lovers to visit Chiang Mai Zoo and enjoy the new transportation service and see the feeding times and animal shows. 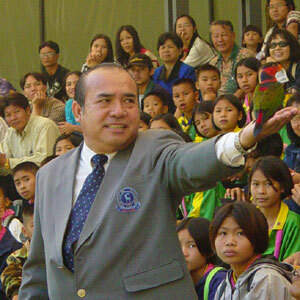 Sophon Damnui, director of the Zoological Park. Go! 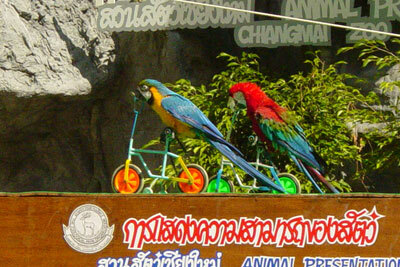 Parakeets zoom along in the bicycle competition! Sophon Damnui, the director of the Zoological Parks, presided over the opening ceremony to officially launch these activities. 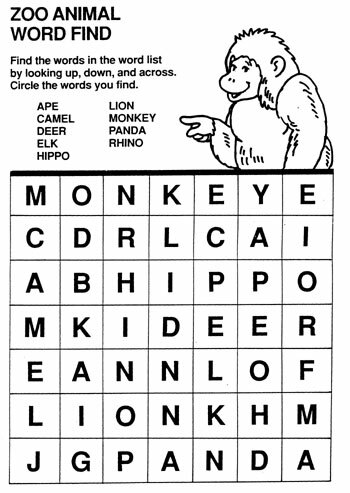 He was confident that the feeding and animal shows would encourage people to visit the zoo. The transportation service provides tour guides giving specific information about the animals and has five bus stops so you can drop in to see the animals in the natural environment of the 500 rai park. The feeding show is performed daily from 10 a.m. to 3:50 p.m., and the animals on show include chimpanzees, tigers, leopards, jaguars, orangutans, gibbons, Indian rhinoceros, penguins, cape fur seals, Asian elephants, hippopotami, African lions and giraffes. The animal presentation is on twice Monday to Friday and three times on Saturday, Sunday and annual holidays. Many kinds of animals will be showing up on stage - the most popular stars of the zoo - including pigeons, macaws, eagle, hawks, owls, gibbons, and otters. Director Tanong said these animals have been trained for the show, with some of them spending many months becoming polished stage performers. Director Tanong also invites people in Chiang Mai and neighboring provinces to come and visit the Chiang Mai Zoo. 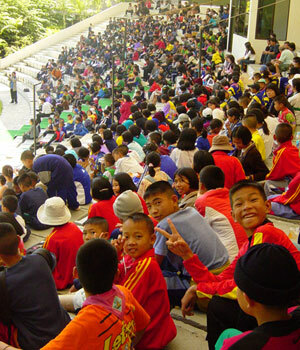 The entry fee for adults is only 30 baht, and 5 baht for children. In January, the month of Children’s Day, children, who under 135 centimeters tall do not have to pay the entry fee.